Aerating your lawn will help to relieve compaction and promote root growth. Thatch buildup can choke your lawn. Get a Free Lawn Analysis from a turf expert whose multi-point inspection includes checking your lawn for damaging insects, weeds, grass diseases, fungus, and nutrient deficiencies. 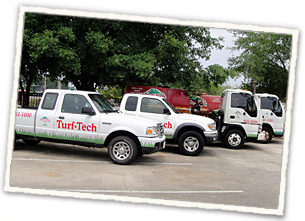 Turf Tech offers a free estimate for lawn spraying, tree spraying, shrub & ornamental spraying, weed management with pre-emergents & post-emergents, and fire ant protection.